Summary and Definition: The assassination of President McKinley occurred on September 6, 1901 inside the Temple of Music exhibition at the Pan-American World's Fair in Buffalo, New York. The name of his assassin was steelworker Leon Frank Czolgosz (1873-1901) an anarchist from Cleveland, Ohio. The President's wounds became gangrenous and he died eight days after he was shot on September 14, 1901. William McKinley was the 25th American President who served in office from March 4, 1897 to September 14, 1901. This article provides facts about the Assassination of President William McKinley and of his murderer, Leon Czolgosz. Interesting description and facts about the President McKinley Assassination are detailed in the Fact Sheet for kids. The history of President McKinley Assassination is told in a factual sequence consisting of a series of short facts providing a simple method of relating the history and events of the President McKinley Assassination. President McKinley Assassination Fact 5: What was the name of the assassin? Leon Czolgosz (May 5, 1873 – October 29, 1901) was born in Alpena, Michigan in the United States, the son of Polish Catholic immigrants. President McKinley Assassination Fact 6: Who was Leon Czolgosz? Leon Czolgosz was a steelworker who had become embittered when he lost his job during the depression that followed the Panic of 1893. He became an anarchist, an extreme radical, and his political views led him to kill the president. President McKinley Assassination Fact 7: What was the Pan-American Exposition? It was a World's Fair, organized by the Pan-American Exposition Company, and held in Buffalo, New York, United States, from May 1 through November 2, 1901. What was the Temple of Music? 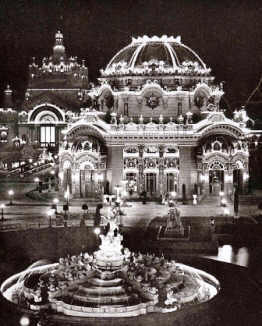 The Temple of Music, where the President was shot, was a concert hall and auditorium built for the Pan-American Exposition. The advent of the electric power system in the US allowed designers to light the Exposition and many of the buildings were covered with thousands of light bulbs. President William McKinley was shot on September 5, 1901 by Leon Czolgosz whilst greeting the public at the Temple of Music on the day that had been designated as "President's Day". President McKinley Assassination Fact 8: The Pan-American Exposition World's Fair was an important and exciting event. On September 5, 1901, the day before the shooting, President McKinley delivered a speech on tariffs and foreign trade at the exposition. President McKinley Assassination Fact 9: The next day on September 5, 1901, the president spent the day at a reception at Niagara Falls and arrived at the Temple of Music at the World's Fair at 4pm, happy to meet and greet the public. President McKinley Assassination Fact 10: The cheerful president was guarded by United States Secret Service detectives, but the venue left him fully exposed to the hundreds of people eager to see him. Interesting history and the President McKinley Assassination Facts for kids are continued below. President McKinley Assassination Fact 11: A man dressed in black with a bandage swathing his hand approached the president. The man raised his hand, as if to greet him, and fired two shots through the bandage which concealed a gun - a .32 caliber Iver Johnson "Safety Automatic" revolver. President McKinley Assassination Fact 12: One bullet struck him on the upper part of the breast bone, glancing and not penetrating but the second bullet penetrated his abdomen. President McKinley Assassination Fact 13: There was a terrible commotion, screaming, crying and shouting as people realized what had happened. Three men leapt on the assassin, two were secret service guards and the third man was an African American who had just shaken hands with the President. President McKinley Assassination Fact 15: The Temple of Music was cleared and Leon Czolgosz was taken to Police Headquarters - he was nearly lynched by the furious crowd. 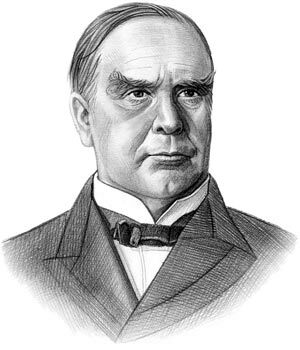 President McKinley Assassination Fact 17: President McKinley initially appeared to be recover, but he took a turn for the worse on September 13, 1901 as his wounds became gangrenous - his wound had not been thoroughly cleaned. He died early the next morning and was succeeded by Vice-President Theodore Roosevelt. President McKinley Assassination Fact 18: Czolgosz was indicted with one count of first-degree murder. He was convicted on September 24, 1901 after the jury deliberated for only one hour. He was given the death penalty. President McKinley Assassination Fact 19: Leon Czolgosz showed no remorse for the assassination and stated "I killed the President because he was the enemy of the good people - the good working people. I am not sorry for my crime." President McKinley Assassination Fact 21: The clothes and letters of the murderer were burned and sulfuric acid was poured into Leon Czolgosz's coffin so that his body would be completely disfigured. He was buried on prison grounds. President McKinley Assassination Fact 22: The body of President William McKinley was taken by train to Washington where he lay in state. Over 100,000 people paid their respects passing the open casket. President McKinley Assassination Fact 23: He was initially laid to rest vault at West Lawn Cemetery in Canton, Ohio. The article on the President McKinley Assassination provides detailed facts and a summary of one of the important events during his presidential term in office. The following William McKinley video will give you additional important facts and dates about the political events experienced by the 25th American President whose presidency spanned from March 4, 1897 to September 14, 1901.